Debt relief Debt relief is any form of debt reorganisation which relieves the overall burden of debt. and official development assistance Official development assistance (ODA) as reported by the OECD, includes concessional loans (with a grant element of at least 25%) and grants by members of the OECD Development Assistance Committee. 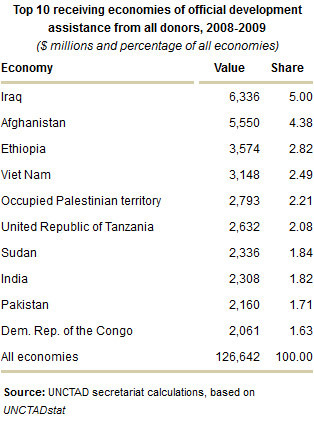 ($ millions) Source: UNCTAD secretariat calculations, based on UNCTADstat . The 2008 G8 statement echoed previous commitments that have been made, including the United Nations Millennium Declaration of 2000. Many of the donors had targets for the year 2010 or intermediate targets to achieve by 2010 before achieving a larger target by 2015, e.g. the European Union’s 0.7 per cent of ODA to the gross national income Gross national income (GNI) is gross domestic product (GDP) less net taxes on production and imports, less compensation of employees and property income payable to the rest of the world plus the corresponding items receivable from the rest of the world. more(GNI) target for 2015. However, the global economic crisis had a negative effect on absolute levels of ODA, since it also affected GNI levels in donor countries. The evolution of total ODA in constant dollars and as a share of GNI for OECD Organization for Economic Cooperation and DevelopmentDevelopment Assistance Committee (DAC) members from the 1960s to 2010 shows a contrasting picture. From the 1970s to 1990s, and again after the late 1990s, ODA flows from DAC countries to developing countries rose steadily. 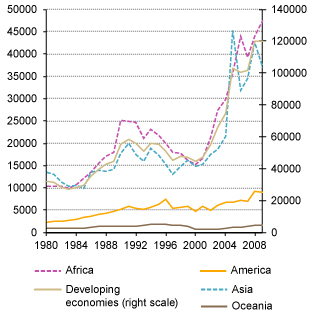 More importantly, since the late 1990s, a series of high-profile international conferences have boosted ODA flows. 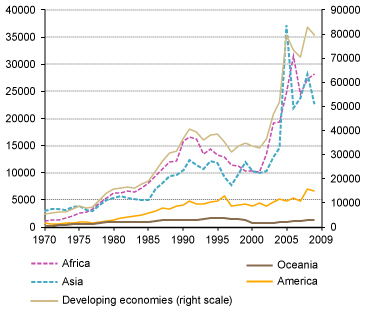 By contrast, total ODA as a percentage of DAC countries’ combined GNI fell between 1960 and 1970, and then oscillated between 0.27 per cent and 0.36 per cent for a little over 20 years, remaining essentially at the same level after the oscillations related to the more recent global economic crisis. At the current rate of progress, donors will not fully respect their commitments in the near future and will remain far from the long-standing United Nations target of providing 0.7 per cent of GNI by 2015. Furthermore, not only has total ODA in absolute value increased, but the composition of aid has changed over the past three decades, with large shifts in ODA allocations towards the social sector (health, education, governance), and emergency assistance and reconstruction activities. The share of ODA devoted to the social sector grew, while that for productive sectors (agriculture, industry, mining) and economic and infrastructure sectors (communications, banking, transport, energy) has declined. According to the OECD, ODA to agriculture and food security fell from its 1980 high of 17 per cent to under 4 per cent of total bilateral ODA in 2007. In the light of the recent food crisis, this is a particularly problematic development. Regional patterns of ODA flows have varied significantly with donor countries’ changing views of the role of ODA (Table) . The overall aid to sub-Saharan Africa has increased significantly over the past 30 years and more so in the past decade in part as a result of the pressure imposed by the MDG agenda. The United States has traditionally justified development cooperation policies in terms of recipient country needs and its own foreign policy objectives. This was true of the Marshall Plan and in the post-9/11 world. 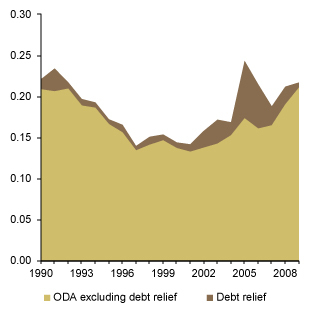 In 2005 and 2006, aid peaked because of exceptional debt relief operations in Iraq and Nigeria. Further, developed and donor countries have more recently tried to tie the question of ODA to trade and investment liberalization. The Aid for Trade Initiative was launched at the 2005 Hong Kong World Trade Organization (WTO) Ministerial Conference, aiming at promoting aid flows for infrastructure assistance. This includes building roads, ports and telecommunications to link domestic and global markets. It also refers to productive capacity assistance related to promoting developing countries exports and to adjustment assistance to facilitate tariff reductions. Several authors have challenged this initiative and pointed out that the links between trade, growth and poverty reduction are more complex that what it is assumed by the Aid for Trade Initiative. Debt relief might be a more important tool to promote growth in developing countries than aid-for-trade arrangements. The debt relief process was greatly enhanced by the Heavily Indebted Poor Countries Initiative (HIPC) and the Multilateral Debt Relief Initiative Multilateral Debt Relief Initiative (MDRI) was launched at the July 2005 G8 summit held in Gleneagles, Scotland. MDRI implies the cancellation of all the debt owed to the IMF, the International Development Association, and the African Development Fund by all countries that reached or will reach the completion point of the HIPC initiative. more(MDRI). According to the International Monetary Fund, debt reduction packages under the HIPC Initiative The HIPC Initiative was launched by the World Bank and the International Monetary Fund in 1996 to coordinate and harmonize official debt relief by the multilateral financial institutions and bilateral creditors for heavily indebted poor countries (HIPC).The HIPC initiative constituted a radical departure from previous initiatives because it included cancellation of debt owed to multilateral institutions, a first in the history of debt relief. morehave been approved for 36 countries, 30 of them in Africa, providing $76 billion in debt-service relief over time. The MDRI allows for 100 per cent relief on eligible debts by three multilateral institutions—the International Monetary Fund, the World Bank, and the African Development Fund – for countries completing the HIPC Initiative process. According to the Jubilee Debt Campaign, more than 32 of the poorest countries in the world have received over $110 billion in debt cancellation. Debt relief fundamentally frees resources, creating additional fiscal space for social spending, and is essential if the MDGs are to be achieved. Debt relief is also an important tool to promote growth in developing countries, since it frees resources, creating additional fiscal space for social spending.